Holy crap I did it! I guess it is now official. 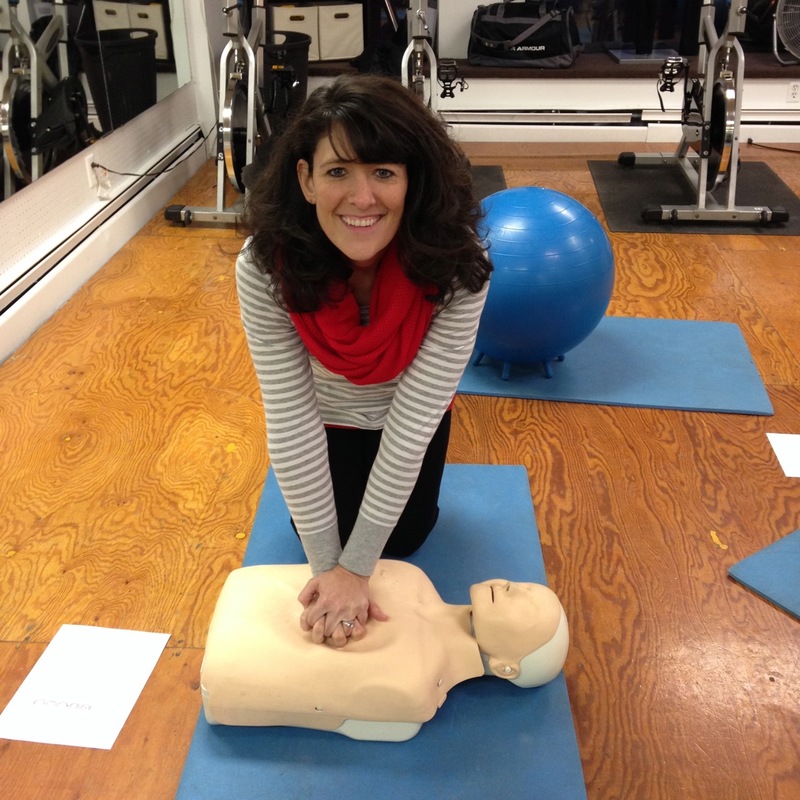 I AM a certified group exercise instructor. And, I am still in shock. 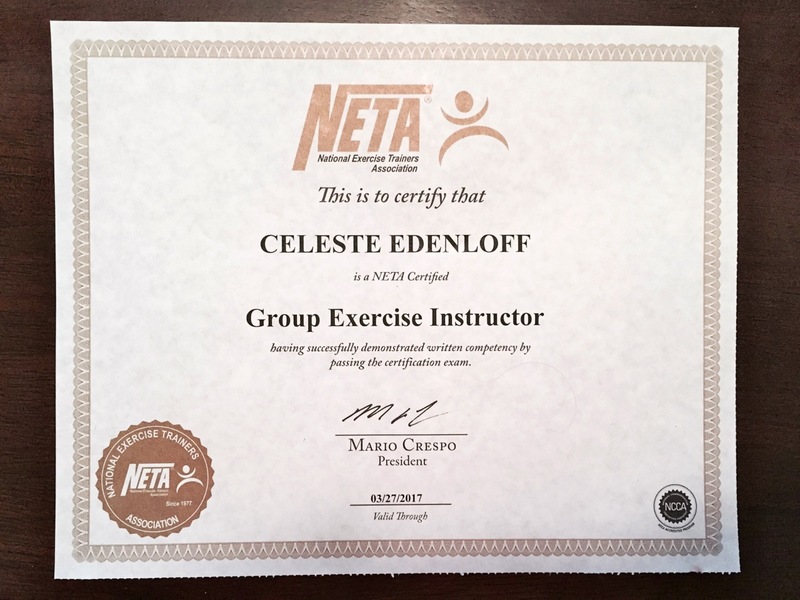 Me, Celeste, a NETA Certified Group Exercise Instructor. 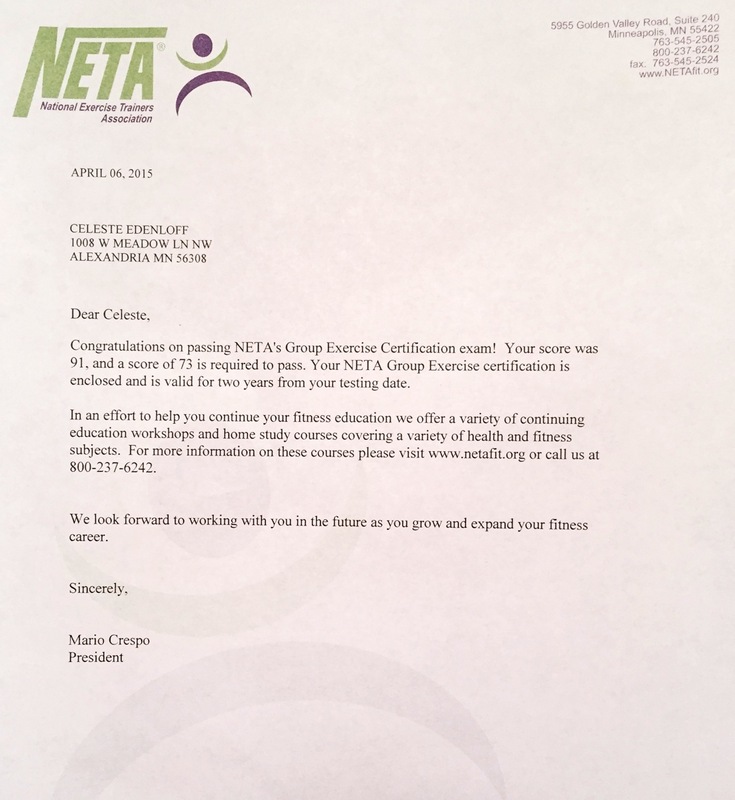 NETA, by the way, stands for National Exercise Trainers Association. I know there were a lot of people who believed in me and a lot of people who were rooting for me, but I am telling you straight up, I was not so sure about it. There was so much to learn. Some of the 25 chapters were easier than others. And some – particular learning the correct terms for our body and body parts and inner workings of everything in our body – were not so easy. But apparently, something click because I passed the test. I needed at least a 73 to pass – out of a possible 100. I know there are some out there who are probably thinking “it’s only a fitness teaching certificate, why all the fuss?” Whoop-de-do, it’s not like I passed the bar exam or passed my boards to become a doctor or something. But this is big to me. It’s a huge accomplishment. I know it’s not much to some, and those few, I guess in all honesty, I don’t really give two hoots about. I am proud of myself. I feel good. I feel accomplished. I am excited. And I am going to shout it from the roof tops! So there. Now you know. Well, now, comes the actual hard part – the teaching! I may know what your cervical, thoracic, lumbar, sacrum and coccyx are. And I may know that your body is divided into three planes – the frontal, the transverse and the sagittal. And I might just remember that fat contains nine calories per gram, carbs have four calories per gram and protein contains four calories per gram. And maybe, just maybe, I might know that when doing a step class, you have to know how to do a 32-count beat. BUT………and this is a big BUT…..I have no idea how to teach an actual class! Well, okay, kind of. The fun part starts now. My next step is to attend as many group fitness classes as I can. Then, I get to job shadow our instructors at Vital Fit Club. Next, I will get to co-teach with some of them and then finally, I should be good to go and actually teach a class on my own. But, I will also get to – over the course of the next couple of months – do tons more studying. Now, it’s time to learn the names of exercises, learn what moves go together (as in flow smoothly), figure out the counting and music stuff and lots more. This is the exciting part to me. Yes, it is going to take time, but it will all be worth it in the end. My plan is start teaching my own classes starting in June. 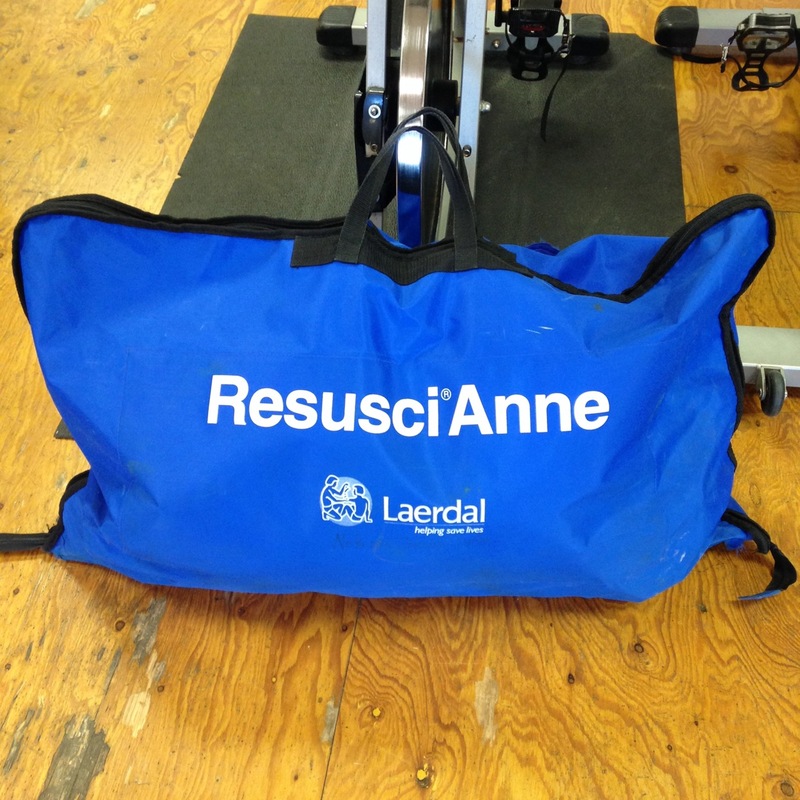 My guess is I will be doing more bootcamp, HIIT and Tabata-style classes. They are more freestyle, which is what tend to like a bit more than the choreographed classes. Don’t get me wrong, I LOVE taking the choreographed classes, such as PiYo and Yoga, but for teaching purposes, free-styling is definitely more my style! I have plans to take another NETA course as part of my CEC’s (continuing education). In May, NETA is actually doing a HIIT and Tabata class at the college here in Alexandria. I hope to get signed up for that real soon! I am so thrilled with this new journey/path that I am on and look forward to helping others again – this time, in their fitness journey! Thank you again for all the support, well wishes, congratulatory messages on my Facebook page and all you believing in me. You all have no idea what it means. Thank you just isn’t enough! But it’s all I have. So, thank you. Thank you from the bottom of my heart! And thank you for continuing to take this journey with me. This is so great! If I were in your area, I’d love to be your first client! I had no doubt 🙂 Congrats, Celeste! HI I came across your blog after researching about NETA GEI test as I am studying to take on Tuesday! I am excited and nervous. Next Next post: So much excitement!